Drive around on the construction job with your new remote control ride on excavator truck with working bulldozer loader. Yes, your child really rides on this truck! R/C digging ride on trucks are great remote control toys that everyone wants to play with. Yes, the digging arm really works and is controlled via the included wireless remote control. When your new construction operator gets the feel for it. Simply flip the switch on the truck to give the driver complete control of all of the functions on the vehicle. Its a difficult task to keep our hands off them and on our work. Have a RC construction truck or construction fan at home? Want more? You can even plug your mp3 player or phone to the truck to play songs or Sesame Street! 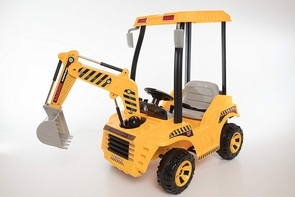 This is the perfect gift for them and makes a great addition to any our remote control construction trucks. Order today and start moving earth and other materials too. Full function remote control allows you to drive in all directions. Still want more? Purchase this RC truck today and get a rechargeable battery pack, and charger. Great for ages 1-8 and holds up to 100 pounds. A child can easily move by pressing on the pedal and can choose to go forward or in reverse by flipping the switch beneath the steering wheel. Once your child comes to a stop they can start digging by using the two levers underneath the steering wheel to move the scoop loader of the digger and begin excavating for thrilling treasures. The ride on car is decorated with plenty of lights making the ride more exciting, plus it contains five different songs that any kid can jam to and enjoy as they ride. If a parent wishes to take control of the car, they can simply flip the switch that is located on it, which disables all functions on the car, and use the remote control to control the movement as well as the digger arm. This remote control (RC) crane can pick up a load and lower it too. Drive forward, backward, left, right, and stop. If you are searching for a high quality construction excavator that can go forwards, backwards, left, right, spin, and dig, you can stop looking. Full function remote control allows the crane to move up, down, and also turns 720 degrees around. This RC crane grabber makes the ultimate addition to any of our remote control construction toys.